We sold this truss dock to Randy for his vacation home in the Florida Keys. 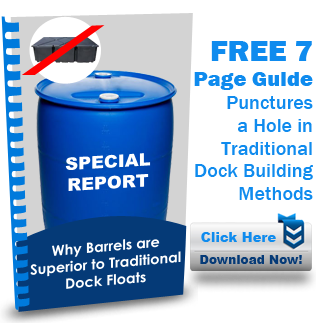 The product was a single 4×12’ truss dock using a total of 4 barrels. The 4×12’ attached to his existing dock to allow the docking of his boat. This dock was installed in a manmade inlet connecting directly to the Gulf of Mexico making our ABYC saltwater approved design very important for his location. Randy put his dock together in his driveway before launching it. He decked it with ¾” treated plywood and used the generic blue barrels. Like many of our customers, Randy was a little concerned at the low price he paid for his system, but found that the product performed as advertised.